The older children get, the less likely they are to leap out of bed on their own at a reasonable hour. While a teen should become more independent, sometimes getting out of bed in time to get to school on time becomes a bigger problem as a child grows older. Teaching your teen to get himself up and out of bed on time, even when he’s tired, is an important life skill. Part of becoming a responsible adult is being able to start work on time and being able to show responsibility. So if your teen is late for school every morning, intervened. Help him learn how to take on more responsibility for his behavior. Nagging him, waking him up repeatedly, and pushing him out the door will only increase his dependence on you, however. So it's important to make him responsible for his own behavior. Whether your child hits the snooze alarm a few too many times, or he doesn't even hear the alarm at all, there isn't a one-size-fits-all way to respond. Children mature at different ages, and you should be less strict with a 13-year-old than with a 17- or 18-year-old who can’t quite seem to be ready early enough to arrive at school before the bell. Your teen’s personality type also makes a difference, some people simply don’t see arriving five to 10 minutes late as a problem—though your teen’s teacher might see things differently. If your teen is late for school, take immediate action. Not only could it hurt his education, but it could also set him up for failure later in life. A teen who can’t get out the door for school on time is likely to become an adult who can’t get to work on time. Once your teen has faced a couple of tardy slips, sit him down to have a talk. Let him know what you expect, whether it’s that he’s awake so he has plenty of time to get ready, or that he’s ready to go with enough time to make the 8:30 bell. Although your teen is getting old enough to manage his own time, it's also important for him to know what you expect. Say, "You're old enough to start getting yourself out of bed on time in the morning. I expect you to set an alarm, get yourself up, and get out the door on time without any reminders from me." Getting your teen out the door and to school on time may take a little bit of teamwork. Rather than fighting with her about being punctual, take some time to talk calmly about how you can make things better together. Identify the root of the problem. Is she overtired because she's staying up too late? Is she unorganized and it she's running around to find things in the morning? Or, does she play on her phone in the morning, causing her to be late? Use it as an opportunity to problem-solve together. You’ll teach her how to approach problems that crop up in her life by brainstorming possible solutions and experimenting with different ideas. Ask for your teen’s input about how she can be on time for school. She may have some simple or creative solutions that will help her get out the door in plenty of time. Write down a few solutions, such time-management ideas. Preparing her lunch or filling a backpack the night before might give her more time. If your teen is struggling to wake up in the morning, a new alarm clock might help her get out of bed. Though you want your teen to gain maturity and take responsibility on her own, she might need a little support from you to get started on the right path. Purchasing an alarm clock can be a huge help in getting her out of bed on time. Sometimes cellphone alarms aren’t loud enough. And, your teen’s cellphone may be one of the things interfering with her sleep. Your teen may be staying awake too late because she’s surfing the web or she may be replying to text messages in the middle of the night. Place the alarm clock on the other side of the room, so your teen has to get out of bed to shut it off. There are even trickier alarm clocks out there—ones that roll across the room so you have to chase them or alarms that slowly turn on lights to mimic the sun. Many high schools start very early in the morning and teens’ biological clocks aren’t geared toward an early start. But, despite the debate over early school start times, most high schools aren’t budging. So it’s important to support your teen’s efforts in getting plenty of sleep. Establish a reasonable bedtime and keep a consistent routine—even on the weekends. 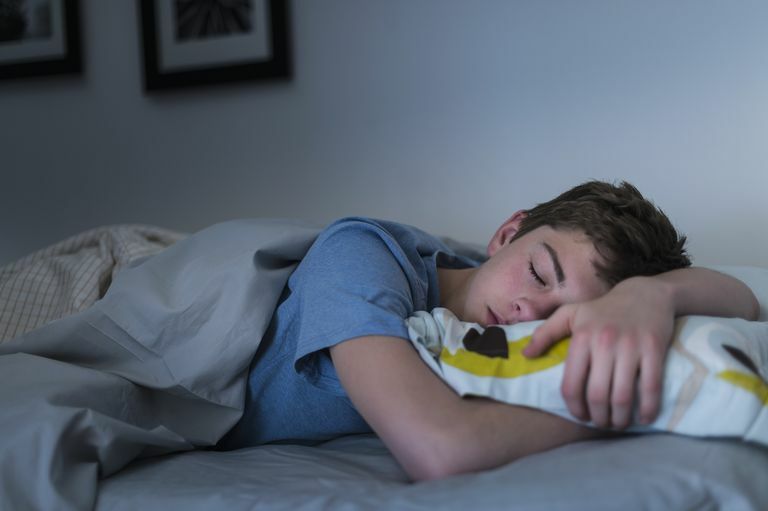 Don't let your teen sleep to late on non-school days as it can interfere with his sleep schedule. If your teen is getting plenty of rest, he’ll be better equipped to get up and out the door on time. So work with your teen on developing good sleep hygiene habits. Create a consequence that will motivate your teen to get out the door on time. You don’t have to charge your teen monetarily, however. But, if your teen receives an allowance, you can certainly dock dollars and cents for being late for school. You can also charge him in video game time, cellphone time or TV time. For every minute he’s late for school—you can verify with the teacher, if necessary—he loses a certain amount of electronics time. If you don’t want to involve the school, tell him that he loses TV or video game time for every minute he makes you wait before he heads out the door to the bus or comes out to the car in the morning. If you have to drive your teen to school because he misses the bus or doesn’t have time to walk, charge for your time. Assign a dollar amount for being your teen’s taxi and either deduct it from your teen’s allowance or assign extra chores to pay for it. As a parent, it’s tempting to get your school on time if he's going to be late. If you take responsibility for getting your teen to school on time, he won't learn. If he doesn’t make it into class before the bell, he gets disciplined, rather than a free pass from you. Eventually, he could receive detention or another form of consequence from the school—and those natural consequences could be exactly what he needs. If the school contacts you about the tardiness, explain to the administration that you’re trying to teach your teen responsibility. They might not be happy about your methods, but they’ll likely understand why you’re doing it. As frustrated as you feel about your teen’s tardiness, remember two key things. First, it’s not about you. You might think that it reflects poorly upon you that your teen can never seem to be on time for you, but it’s unlikely that your teen’s teacher or the school receptionist is judging you, as a parent, for the student’s shortcomings. Second, don’t forget that your teen has different priorities than you do. You’ve had years of work experience to make you realize the importance of showing up on time or facing the consequence, but your teen is still learning that importance.